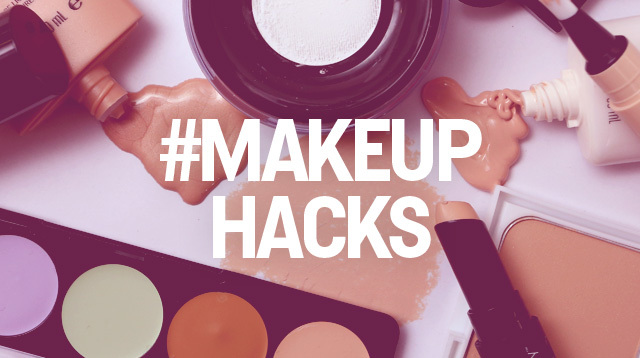 These aren't your average makeup tips and tricks. 1. Turn a pencil eyeliner into a gel formula with the help of a match or lighter. Hold your black, green, burgundy, etc., kohl eye pencil (which typically creates a thin, harder-to-apply line), under the flame for one second, let it cool for 15 seconds, and then watch the consistency change right before your eyes. Finally, glide on your newly made gel liner for an instantly smudgier formula. 2. Cover your eyelid with white liner to make any eyeshadow shade pop. 3. Draw your cat-eye first, and then fill in the open space for a perfect winged liner application every single time. It's much easier this way. Use this tutorial as your guide. 4. Use a spoon to create the perfect winged liner. Holding the stem of a spoon against the outer corner of your eye, draw the straight line as the first step for your cat-eye. Then, flip the spoon so it's hugging your eyelid, and use the rounded outer edge to create a perfectly curved winged effect. 5. Draw a slanted hashtag at the outer corner of your eye, and then blend it for an instantly smokey effect. To create a super-easy smokey eye, draw a hashtag symbol right before the outer corner of your eye and then blend it out with the smudger at the other end of your eye liner. Blowing hot air on your eyelash curler will help your lashes curl easier and stay curled longer; it works the same way heat changes the pattern of your hair and holds a curl with a curling iron. To do it, hit the lash curler with your blow dryer until it heats up, wait until it cools slightly but is still warm (you want to be sure not to burn your eyelid), and then clamp down on your lashes to curl them. The translucent powder helps grip the mascara in between coats, leaving you with fuller lashes. Try out this tip by following this tutorial. 9. For long-lasting lip color, swipe on your shade, lay a tissue over your mouth, and then dust translucent powder over it to set the color. 10. Mix loose pigments with a salve or petroleum jelly to make your own custom lip gloss. If you have loose eyeshadow pigments that you're obsessed with and want to wear as a lip shade, blend it with a little bit of a salve, or petroleum jelly in a spoon and swipe it onto your lips. Voila! 11. Perfect your Cupid's bow by drawing an "X" on your upper lip first as a guideline. To make the Cupid's bow part of your pout look perfect, the easiest and quickest way is to take a lip liner in the same shade as your lipstick and create an "X" at your Cupid's bow. Then, apply your lipstick as you normally would and voila! 12. Conceal dark circles and puffy eyes the right way by creating a triangle with your cover-up. You might be a fan of dotting on your concealer in the spots you need it, but the best way is it to actually apply it in a triangular formation with the base of the triangle directly under your lashline and the point toward the bottom of your cheek. This shape helps conceal any redness at the bottom of your eye and at the sides, and then instantly creates the illusion that your face is lifted, since the brightest point is the most intense under your eye. 13. Make contouring look more natural by using a pencil, pen, or makeup brush handle as your guide to finding exactly where your cheekbone is. 14. Map the contours of your face with a gel eyebrow pencil, since it's easier to apply precisely and blend in.